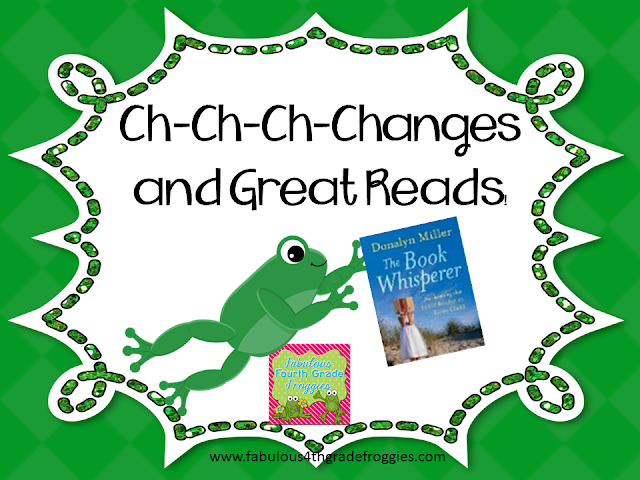 Teach Laugh Plan: Ch-ch-ch changes, & Great Reads! School is out and my summer has begun! YAY!!!!!! My poor classroom is empty! No posters, no nothing! It would be shocking for my students to see since I usually have so much stuff out....mostly frogs. :) My last day was Friday, June 7th and so far I have been a total couch potato! Yup, it's true, I've wasted the last 3 days just chillaxing! I needed to "do nothing". It's just what the doctor ordered....... Well, actually my doctor wants me to exercise but we don't need to tell her about the last 3 days. 7:45 students arrive to homeroom, unpack backpacks and watch announcements. When announcement are over, lets's say at 7:55. 7:55 - 8:20 will be school wide morning reading (maybe). At 8:20 I will teach ELA to my class and my partner will teach Math to her class. At 10:10 we break for specials rotation). At 11:00 I will teach Sci/SS to my own class and my partner will teach Sci/SS to her own class. 11:55 recess and then lunch at 12:15 for both of us. 12:55 - 2:35 my homeroom will go to my partner for Math and her homeroom will come to me for ELA. I wish I would have a bigger time block for teaching ELA but I will do what I have to do. We have 6 teachers on 4th grade and we will all partner up with the person across the hall. I will let you know how it works throughout the year. I really need to think this all through......desk tags, student supplies, etc. If you have team taught before PULEASE let me know your secrets....any advice or tips would be so helpful. A new principal and team teaching are enough changes but there is another big change..... my daughter has graduated High School!!!!!!!! How can that be when I still have my fat from my pregnancy with her???? Actually her graduation ceremony is Thursday. I am not sure I can handle her growing up! How can I be old enough to have a college student? My son is going to be a Sophomore so I have a few years before I have 2 in college. Holy Old Lady Batman! Time flies!!!!!! 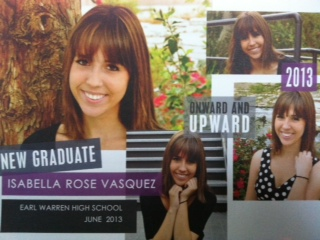 Bella's graduation announcement - isn't she beautiful? Enough about change.......well, kinda. I am reading The Book Whisperer by Donalyn Miller. O.M.G. its one of the best teacher resources I have ever read!!!!!! I am hosting a book study on it on my other blog We Read, We Blog, We Teach. The first post will be up by Friday. This book will CHANGE the way you look at your reading instruction. If you read only one "teacher book" this summer this is the one you MUST read. Here are some other great reads I have on my summer reading list. Looks like I need to get a non-teacher book list started. Hoppy Reading and Hoppy Summer friends! Time is always an issue for me Lauren, even when I have a self-contained class. LOL! I'm so glad you are joining our book study! Yahoo! My teaching partner and I team taught for the past couple of years. We switched rooms so the students stayed in their own desks. Easier and faster for us. No one says that their pencil or whatever is missing. Hmmm that's an idea Jolene! LOVED the Book Whisperer! I am looking forward to rereading it this summer along with your blog. Thanks so much! I'm so glad you are joining the book study Jennifer! Your daughter is beautiful! I just started the Book Whisperer and look forward to hearing other peoples thoughts on it - also excited because I didn't know you had another blog! I LIVED The Book Whisperer!! Did you see that Donalyn Miller has her new book coming out this fall?! October, I think! I can't wait for her new book!!! I didn't see that Donalyn Miller has a new book coming out. How exciting Bev! I have team taught for 10.5 years and love it! I also teach ELA/SS to 4th grade. We have our students bring everything with them when they switch classes. They keep all of their notebooks, workbooks, and folders in their school bags. Their textbooks are left in the desk. Of course we always have students who leave their pencil or a notebook by accident. They are given three strikes. Also time is always a crunch with ELA. I had about 2 hours to teach ELA including Reading, Writing,Grammar and centers and about 30-45 minutes to teach SS every day. I always stress about it every year, but it ends up working out. Let me know if you have any other questions. I team taught (ELA) three years ago and my partner and I had a little bit different situation than anyone else's comments (I think). My very best teacher friend helped me make cloth seat covers to place on the chairs. My homeroom had the desk in both classrooms and my teaching partner's homeroom had the seat covers in both classrooms. We also used the small "shirt" name tags to label the desks. 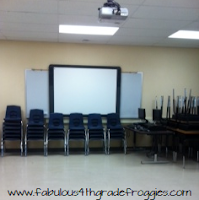 My homeroom on the left and hers on the right (again in both classrooms). We had supply caddies in the center of our desks, which were organized into groups. Everything supply-wise stayed in the caddy. EVERYTHING was community. No "this is my pencil, my eraser, etc..." It worked out very well. It's just a suggestion. I hope you guys find what works for you! I've been in a team teaching situation like you described for the last 4 years. Since we mostly had our own homerooms I just had nametags on the desks for my homeroom. When the other homeroom came in I assigned them seats and they were really good about remember where they sat (only took a few reminder from looking at my chart). As for supplies, my students have cubbies that they are to use for holding their supplies. I tell them anything left in the desks is left at your own risk! I hope you have a great year! I ordered The Book Whisperer and I can't wait to read it and join your book study. I have read Teach Like a Champion and I LOVED it! I found it very easy to incorporate the strategies in my classroom. I think you'll enjoy reading it. In fact, my principal liked it so much she bought a copy for all the teachers! I can't tell you how much I love the Book Whisperer so far! It's amazing! I am so glad to hear that Teach like a champion is great too! Oh goodie! I have had The Book Whisper on my shelf all year, but I haven't had time to pick it up yet. I'll try to catch up for Friday!! We are also getting a new principal this year. I think it will be good to shake things up a bit too. 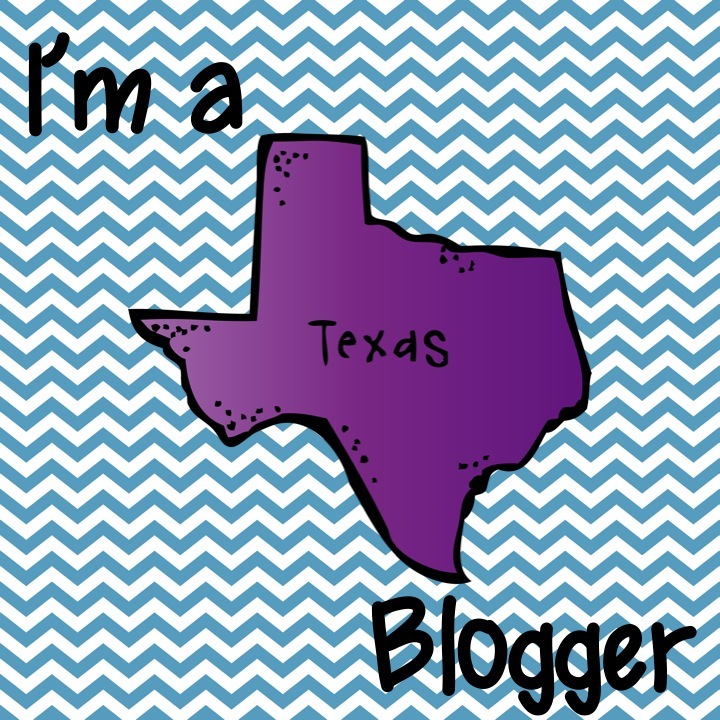 I know you teach in SA, but are you in NEISD too? I am moving to 4th (from 2nd) this next year. Our entire school, beginning in 1st grade, ability groups for reading and the children are used to switching to a reading teacher. We have 10 teachers. Each teacher will teach reading and then only one other subject. My subject is math. I will teach 2 math classes (also ability grouped). I'm excited and scared at the same time!!! You will love 4th grade Cynthia! I am so glad you are joining us Brandee! Yes, we should definitely do a book study on her next book!